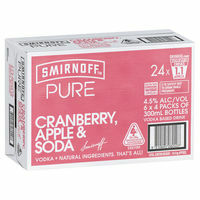 Smirnoff Pure consisted of just vodka & natural ingredients with nothing to hide. Its a clean & refresh taste, without being too sweet. Smirnoff Pure Cranberry, Apple & Soda is light and tangy, with faint floral berry spice, and a slightly fermented apple flavour.